It’s 250 A.D., and the Roman Emperor Trajan Decius has come up with a sure-fire way to get rid of those pesky Christians. He orders everyone in the empire – under pain of death – to make sacrifices to idols of the Roman gods, figuring the Christians wouldn’t do it. He was right, they wouldn’t. And so the lions got some unexpectedly tasty treats. Edict from Rome was a ruse to get rid of the empire’s Christians. Some accounts say the emperor’s edict were particularly aimed at wiping out the large group of Christians nesting in the mega-city of Ephesus on the coast of modern-day Turkey. There, in the Roman capital of Asia Minor, seven Christian lads are said to have escaped the onslaught by ducking into a mountain cave, where they fell asleep for a long, long time. The youngsters awoke some 180 years later, not knowing that by 313 A.D. it would be OK to be a Christian, and by 380 A.D. Christianity would be the official religion of the Roman empire. The townsfolk were amazed, too. Especially when the young men tried to buy things with coins dating back to Emperor Decius. Amphitheater where St. Paul preached. The Golden Legend, a best-seller of the Middle Ages, takes the story through a few more twists and turns, then tells how the Roman emperor (Theodosius) at the time compared the seven youngsters’ awakening to Jesus’ resurrection of Lazarus. How and when the sleepers died is kind of fuzzy – some say their tombs are right in the cave, which was later bricked in to look like a church -- but they were eventually honored as saints. Their Catholic feast day is on July 27 and on Aug. 4 and Oct. 22 in the Greek Orthodox Church. 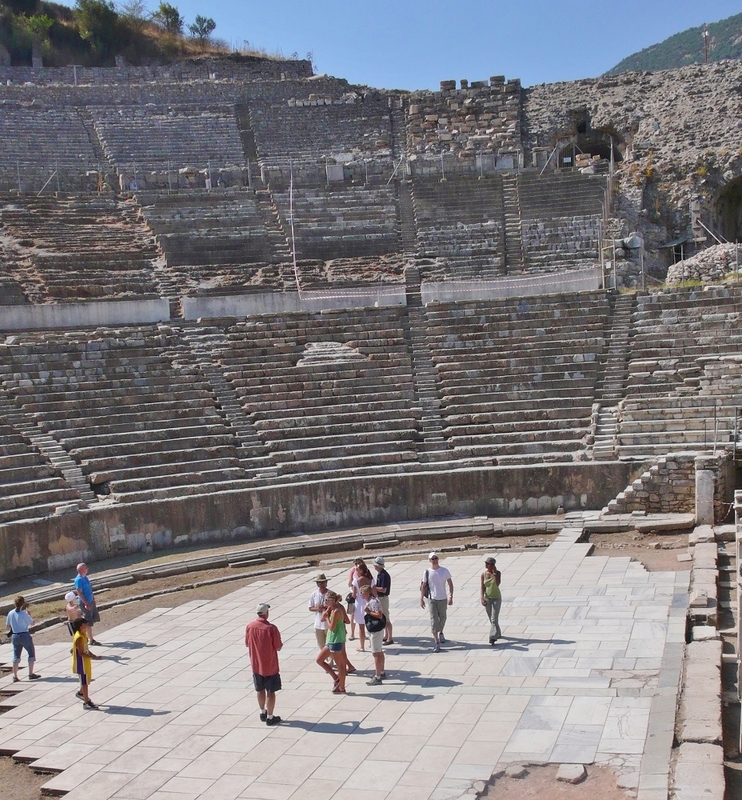 Visitors to Ephesus can see what’s believed to be the site of the cave in a grotto of catacombs, tombs and graves near the city. The city hosts close to a million visitors a year, many from cruise ships docked at the Turkish port of Kusadasi. 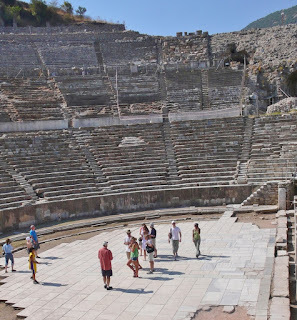 Tour buses take sightseers on a 20-minute ride to the ruins, during which guides note they’re about to see the partially restored remains of the second largest city in the whole Roman empire, topped only by Rome itself. 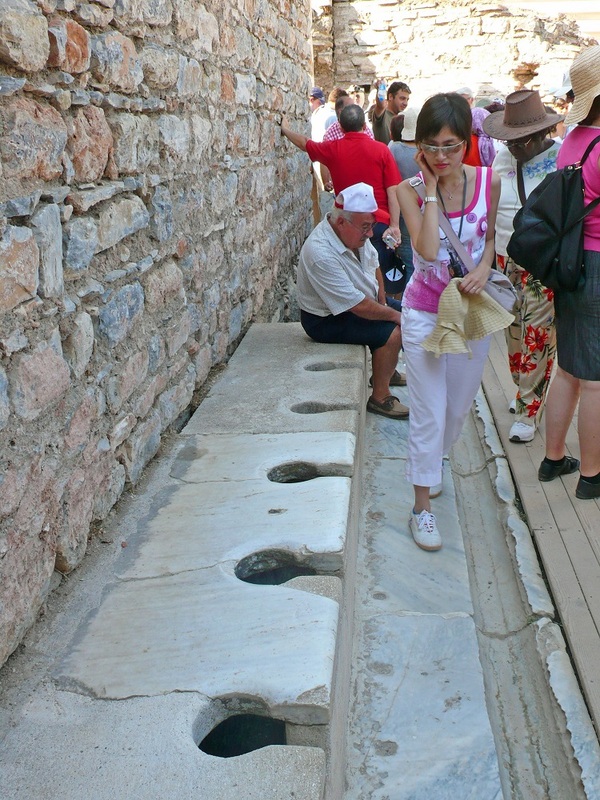 Outdoor public potties were kept warm by slaves. 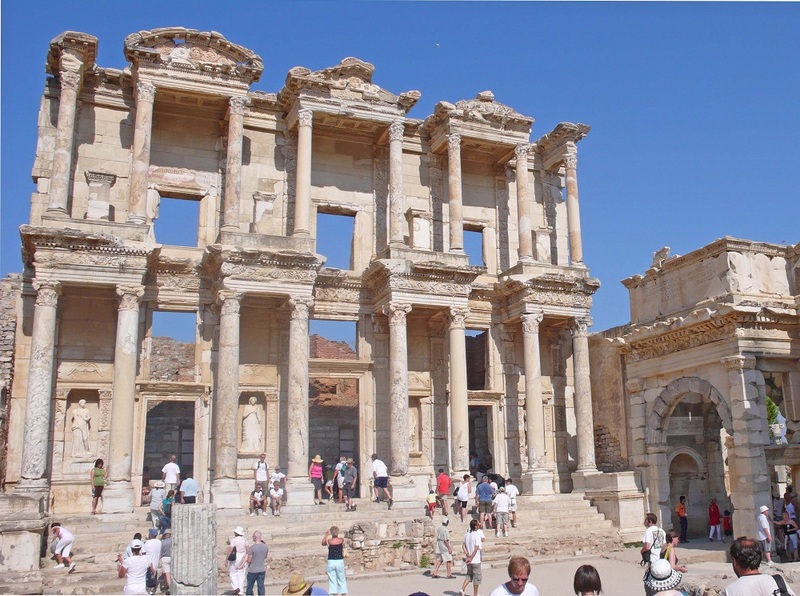 On most days the city is alive with tourists scampering around the iconic library of Celsus (where scholars once pored through 12,000 scrolls), a nearby brothel, all kinds of temples, shrines, fountains and gates, a 25,000-seat amphitheater (where St. Paul tried to preach to the Ephesians), public “latriana” potties (kept warm by slaves sitting on them during the winter) and the hillside homes of the Roman silky set. Out in the boonies of the city is an odd-looking marble column, patched together from pieces of smaller columns. The lone column marks the location of Ephesus’ greatest treasure: the spot where the most wondrous of the Seven Wonders of the World – the immense Temple of Artemis (the twin sister of the Greek super-god Apollo) – once stood. 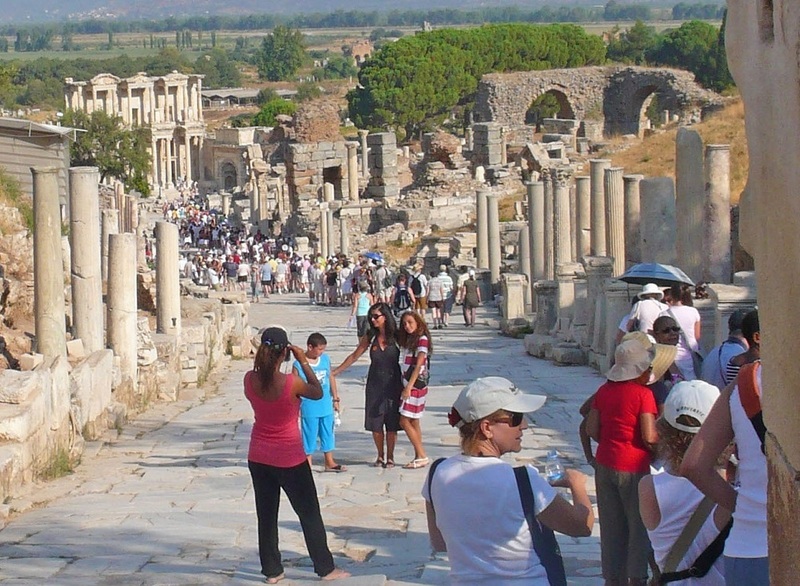 Ephesus hosts nearly a million visitors a year.